When I'm looking for an easy on-the-go snacking option, more often than not I will grab some dried fruit and nuts. 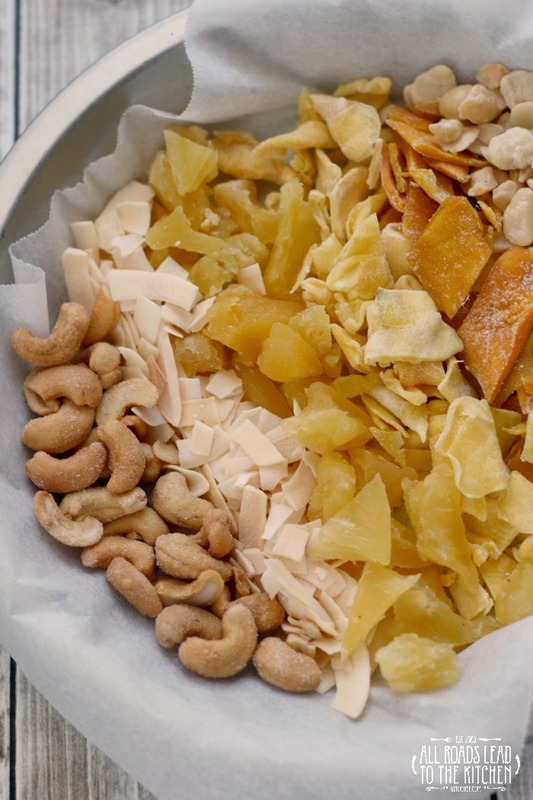 I love the contrast of intensely concentrated sweet and juicy fruit alongside the crunchy, salty nuts. Not only is it a simple fix, it's also a nutritious fix. But the best part is that by throwing a few kinds of fruits and nuts together, you have a completely customized trail mix that can be stored in a jar on your pantry shelf and poured into a baggie or container when you need a fast snack. 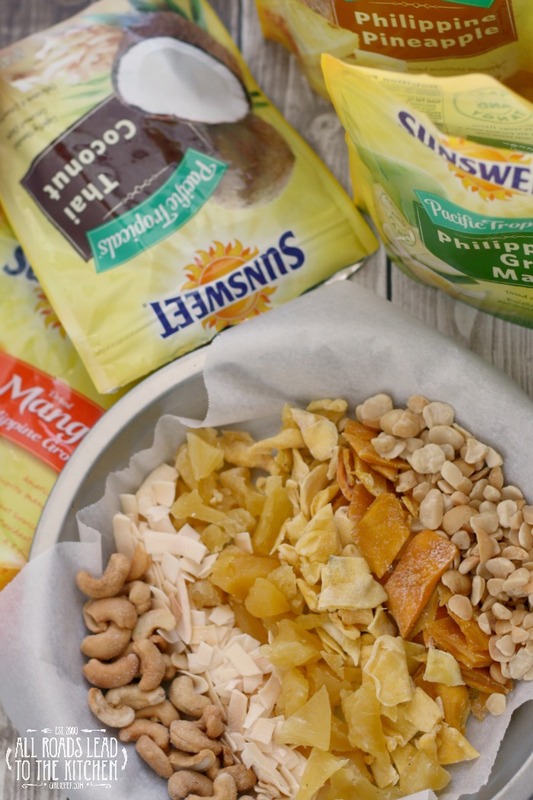 Sunsweet recently launched a couple of new dried fruit flavors to complement their Philippine Tropicals line of dried fruit. Sourced from unique micro climates that have ideal growing conditions, these sweet, succulent dried fruits let you experience a burst of the tropics with each bite. Hey, if I can't be in the tropics, at least the tropics can be in my mouth. The two new fruits are Philippine Green Mango and Thai Coconut Chip. The green mangoes, which are picked early—just as they begin to ripen, pack a tangy punch that absolutely excited my taste buds. 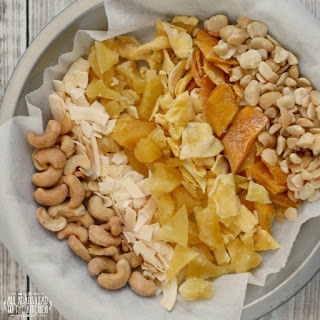 The coconut chips are sweet and crunchy with a hint of vanilla, and add just the right amount of sweetness to a trail mix (in my opinion...I'm not big on actual sweets in my mix). These two joined the previous Philippine Mango and Philippine Pineapple in Sunsweet's Tropical dried fruit line. Marabella Mangoes, which are apparently so sweet that even the locals can't get enough of them, are used to create the sweet, juicy strips of mango and hands-down this is THE BEST dried pineapple that I've ever had in my life. While I love fresh pineapple, I've never been a fan of dried since I've always found it to be too hard and too sweet. Sunsweet's Philippine Pineapple is soft and juicy...and tastes only like intensified pineapple. So, while the tropics in your mouth is a wonderful thing, so is your mouth in the tropics. Right now, Sunsweet is holding a Facebook contest allowing their fans to win a getaway to their choice of one of three tropical destinations (Hawaii, a Caribbean Cruise, or Florida). There are also opportunities for weekly winners to receive a gift basket containing the new Tropicals flavors and beach gear. To find out more, click over to the Sunsweet Find Your Paradise Sweepstakes. My fingers and toes are crossed in hopes that I (or you) win one of those tropical vacations. Until then, let's close our eyes, munch on this tropical trail mix, and envision ourselves already there. 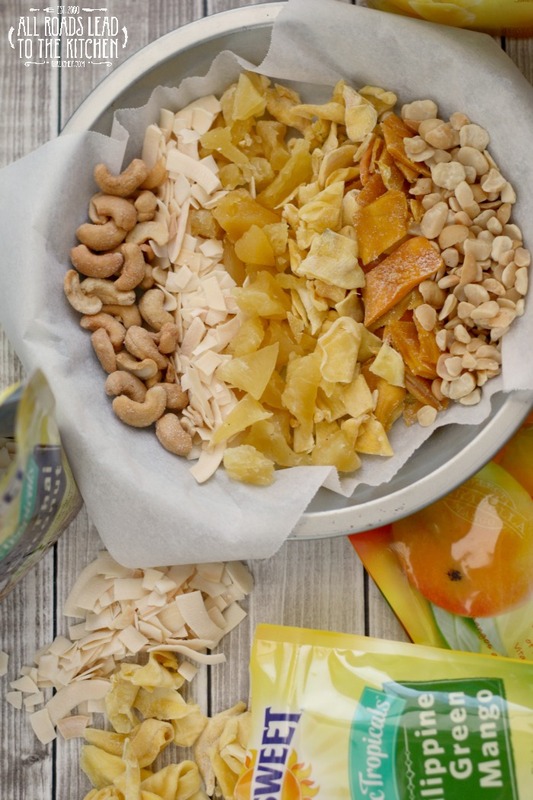 Juicy chunks of dried tropical mango, green mango, and pineapple plus sweet coconut chips and roasted cashews and macadamia nuts. 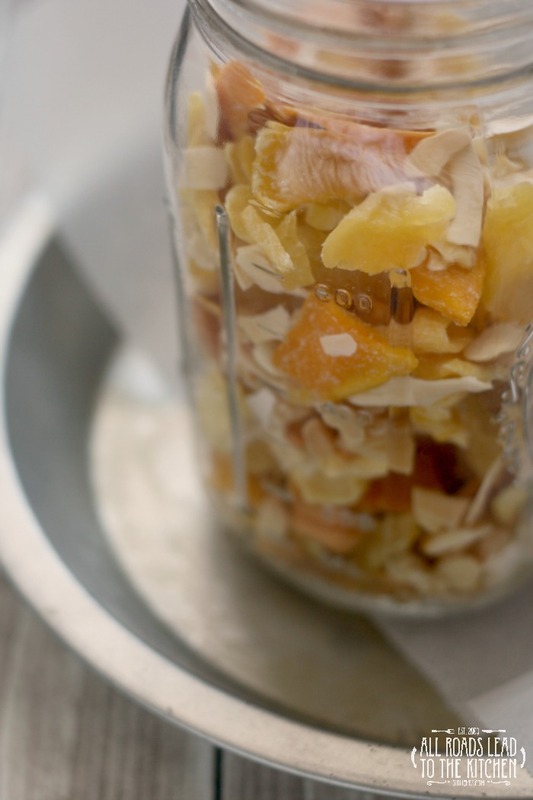 Toss all of the ingredients together and store in an airtight container. Adjust ratios to your own liking, if necessary. If you like chocolate in your trail mix, trying adding a handful or two of white chocolate chips to the mix. What is YOUR tropical dream vacation?